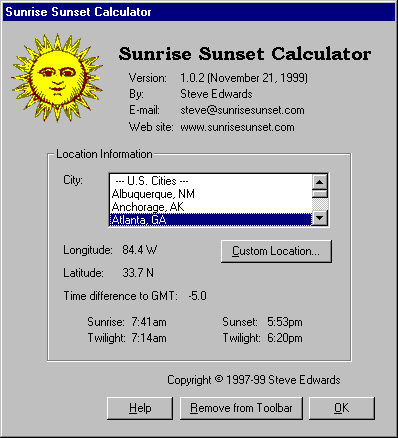 This is a freeeware program that calculates sunrise, sunset and twilight times for locations worldwide. Once you set your location, you can hover your mouse over the sun icon to get some basic sunrise and sunset information or you can click on the icon to get more detailed information. The program uses formulas which are accurate year-round to within a few minutes for all states except Alaska. Even in Alaska it is generally accurate to within five minutes. In addition to calculating sunrise and sunset times, the program calculates three different twilight times: civil, nautical and astronomical. Also calculated is how much daylight and total usable light there will be for the current day. When the program is started the following window will come up for a few seconds; to get it back simply right-click on the sun icon in the taskbar by the clock. You can then choose a city that the program will use to calculate all sunrise and sunset information. The Sunrise Sunset Calculator comes with 76 U.S. cities, 14 Canadian cities and 40 international cities. If your city is not listed in the city list, you can add your own custom location. The freeware version is limited to one custom location. Do you need to know the times of sunrise or sunset for a certain location for a particular date? Try creating a calendar available at www.sunrisesunset.com/predefined.asp. It will display a one month calendar for a location selected from a predefined list or from a user-entered form. When requesting Daylight Saving Time (DST) information from Windows 95/NT, the operating system was always returning DST based on the North America settings, i.e. first last Sunday in April to last Sunday in October. The program has been corrected to get the correct DST from the Windows operating system. New sun icons and the more information screen shows sun times for tomorrow. If this sounds like a program you would like then download it here. Currently, only a zipped version (46KB) for Windows 95, 98, NT 4.0, XP, Vista, 7 and 10 is available. Windows XP and newer can open the .zip file as you would open a folder. If you use Windows 95, 98 or NT 4.0 (which cannot open the .zip files), you can use the software at WinZip to extract the Sun.exe program. Please send an email to let me know how you like it or if you would like to request any modifications. We are looking into compatibility issues with Windows 8. Currently, there are no plans to update this application. Also, please see the FAQ page for further help with this application.